Can Apple Cider Vinegar Actually Help With Weight Loss? Apple cider vinegar, or ACV, is said to have a variety of benefits ranging from helping with diabetes to easing digestion. Some people swear by their daily shot or elixir as an essential part of their wellness regimen. Given it's popularity, it's not surprising that there has been a diet created around apple cider vinegar. Supposedly, taking apple cider vinegar before meals helps you lose weight, and there are even pills and supplements available. But will it really help with weight loss? The Research on Apple Cider Vinegar for Weight Loss: Can It Help? One of the few studies to test the idea was conducted in Japan. During the 12-week study, 175 people who were considered obese took either a drink that contained one or two tablespoons of apple cider vinegar or a drink without vinegar (but with added lactate to mimic the taste of vinegar). At the study’s end, those who had consumed the vinegar drinks had a slight reduction in body weight compared to those who had the non-vinegar beverage. The group that took one tablespoon of vinegar lost 2.7 pounds after the 12 weeks and those who took two tablespoons lost 4.2 pounds. Four weeks after the study, however, most participants had regained some or all of the weight. In another study, a beverage containing apple cider vinegar was linked to weight loss, however, it was a very small study and participants were also on a 21-day low-calorie diet. Consuming any type of vinegar before a starchy meal may slow the post-meal rise in blood sugar. In a 2017 review published in Diabetes Research and Clinical Practice, researchers analyzed previously published studies and concluded that vinegar may be effective in blunting the glucose and insulin levels after meals. If you're considering trying apple cider vinegar, some experts suggest limiting your intake to no more than four tablespoons a day, diluted with water or taken in food. You can add apple cider vinegar to your diet in several ways. Some people add a teaspoon to a glass of water and sip it before meals. You could also try switchel (a refreshing beverage with apple cider vinegar, ginger, and other ingredients). If you don't like drinking apple cider vinegar, try eating a salad with a splash of apple cider vinegar before a starchy meal. The ACV is a good substitute for bottled dressing which is often laden with calories, sugar, and fat. Although apple cider vinegar tablets are available, they can contain varying amounts of acetic acid. Apple cider vinegar (in liquid or pill form) can irritate and injure the throat, esophagus and other parts of the digestive tract, especially when taken concentrated or in large amounts. Low potassium levels and bone mineral density have been reported with excessive, long-term consumption of apple cider vinegar. At least one case study has found that the acidity of apple cider vinegar may erode tooth enamel. Drinking it diluted and through a straw may help by reducing direct contact with teeth. 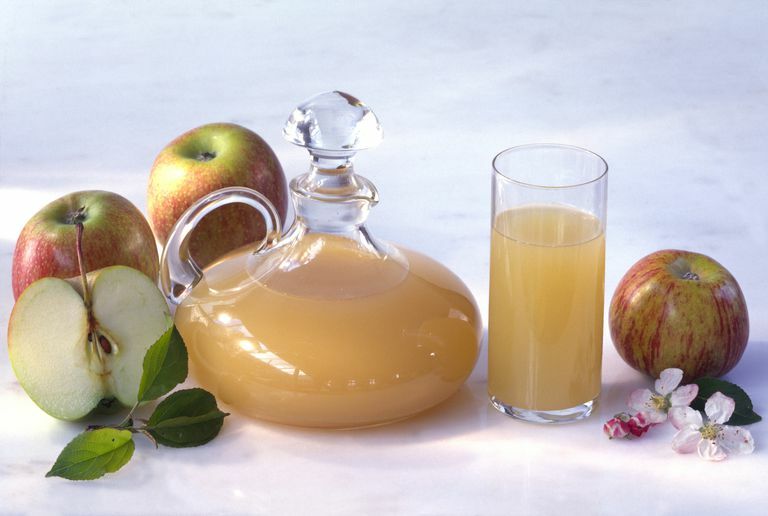 People who have conditions such as gastroparesis, ulcers, hiatal hernia, GERD, and low potassium may need to avoid apple cider vinegar, and it may interact with certain medications (like diuretics and heart and diabetes medication), so it's a good idea to consult your health care provider before taking apple cider vinegar regularly. Weight loss can be one of the most important things you do for your health. We all know how challenging it can be, but losing excess weight can help you feel better, sleep better, and decrease your risk for heart disease and other health conditions. While it's possible that vinegar may offer some benefits, there is virtually no research on apple cider vinegar for weight loss. The results of one study suggest that any effect is probably subtle, and any weight that is lost may return after stopping the vinegar. Other studies that have been done have been small or have had some problems with the study design. While apple cider vinegar in homemade salad dressing or other recipes adds flavor, it would be wise to skip it as a strategy for lasting weight loss in favor of a plan that pairs healthy eating with regular exercise and lifestyle changes. Keeping a food diary, getting eight hours of sleep each night, and keeping your stress in check may also help you reach and maintain your healthy weight. Balliett M, Burke JR. Changes in anthropometric measurements, body composition, blood pressure, lipid profile, and testosterone in patients participating in a low-energy dietary intervention. Journal of Chiropractic Medicine. 2013;12(1):3-14.